Comic Books, God, and nature? Here is a strange tale for you, but it is mine. I was a popular kid during my school grades of 1-4. It just happened I knew the right people because of where we lived. My neighbors were popular, we played together, I became popular right with them. Then 5th grade came and my parents moved to a farm house isolated in the country. I had a one hour bus ride every day. I knew nobody. I finally made a friend and he was not popular. Neither was I. And so began my trip to inversion. I was probably naturally inverted all along, but a move to the country, isolation, no one to play with, a love for nature and solitude, it really brought it out in me. I was never popular at school again, and I was terrified of anything requiring to speak in front of people. These were some of the “bad effects” the move had, but what was God up to? What was his purpose in this? Why suddenly rip me out of a place where I had everything going, and set me up for complete failure? I hesitate to share this because you are going to think I’m crazy for sure. You might not want to read this blogsite. You might think this can’t possibly be right? But I have decided to take the risk and share my story because of where it has led me. It has a strange start, but a very happy ending, and this blogsite has evolved into the result of all my years of research and study. The search for the Holy Grail, as they say. You see, for me, the Holy Grail has always been trying to figure out how to live the “supernatural” side of our Christianity? I have always believed that Christians are called to “walk on water”, and I have lived in a portion of that for many years now, but did not have enough success to be able to really share it with others in a definitive way. However, approximately a year ago I found the door that I have spent my whole life looking for. I found it in a definitive way. I found it on a level that drastically affected everything, like Spiderman getting bit by the radioactive spider. I found it on a level to share, teach, and exemplify. When Jacob and Rachel left Laben, and Rachel stole the family gods, Laben did not find his gods because he failed to look under the woman! God has hidden some powerful stuff under the woman. He knows humility will be required if we ever look there. I’ve been searching so many years, but when I finally got broken enough to look under the woman, I finally found! And I learned that it is the bird with broken wings that soars, and soaring is God’s supernatural! So, back to my story. What was God up to? Why yank me out of popularity and isolate me with nothing but nature, my Bible, and comic books? Yes, that is right, I said comic books, but please hear me out because I questioned God on this for a long time, before I ever really understood. The nearest town was two miles from us and it had one main intersection with a four-way stop. This town was so small that it hardly qualified as a town. It had a gas station, a tavern/pool hall, and a small grocery store. That was about it, but the grocery store had a comic book stand. One of those metal types that squeaked when you turned it. There were no big fancy comic book stores back then, and I had never looked at a comic book before, but I remember it to this day. We were in the small grocery and mom was shopping, so I wondered about a bit and then came across this stand. I had nothing better to do, so I pulled one out. It happened to be like the 2nd or 3rd issue of Spiderman. I was amazed by it. It spoke to me! I decided to ask mom if she would buy me a comic book? She did and the rest is history. I mowed lawns for money and watched that stand like a hawk! It was the only thing that existed in that little town as far as I was concerned. What is a comic book? Now they have changed a lot since I was a kid, and there are many I would never read, but the basic comic is a story of good defeating evil. You have heroes! Not only that, but they are “super” heroes having some kind of powers! To that I ask, what has God invited us to? Where does the power come from to be a light in a dark world? Do we not face a supernatural enemy? Does not light need a power source, and how do we stay tapped into that power source? What are the supernatural tools of our faith? AND ONE MORE THING! All the superheroes I read were TOTALLY DEDICATED to their cause! (And this really got in me! That is why I talk about being “Samurai” for Christ.) That total devotion and focus ALWAYS affected me. It was part of what God was getting into me. I’m a very visual person, and comics are all about pictures and art work! It worked for me. I grew up on a spiritual diet of Bible, nature, and comic books. This diet set me on a quest, like a Harry Potter in reverse, to learn how to walk in something that was not “ordinary”, because my Bible told me there was a supernatural lifestyle I could live. I knew faith had a lot to do with it, but that is only one key to only one of the doors involved. I reached a certain level of what I was looking for many years ago, and have enjoyed living in it, but I knew there was more, and it was a powerful piece of the puzzle, a Holy Grail, and I kept praying, studying, preaching, asking, and seeking. I was Batman in the Bat Cave. A Samurai seeking to serve his master. A Bounty Hunter on a trail. Wolerine in the deep woods with the wolves. This is the way I enjoy living. It is the way I grew up, secluded, isolated, quiet, pondering, exploring, and dedicated to the cause. At the beginning of the year 2013, I asked Rachel to get off her pillow and I looked to see what God had hidden there. I reached this point because of being so hungry to see a greater move of God in my life, that I literally broke. When I broke, God began revealing to me the incredible power of true surrender. I began to see more clearly than ever something I knew in my head, but it had not become a part of my heart and my being. It was then I started writing the X-Superman articles. (Notice the comic book analogy? LOL.) Those articles put my feet to a spiritual Bounty Hunter’s path that has led to incredible things. That is where I found the door I had been looking for! God handed me the key and I made a choice to unlock the door and step through. For a solid year I practiced, taught, and preached what was on the other side of that door, and then at the beginning of 2014, my back gave out. I had a ruptured disk, pinched nerve, broken bone material, various other things, and eventually wound up in back surgery. I will never do heavy lifting type jobs again. Shifting a clutch also still affects my back. God yanked me out of being a truck driver and I have not worked a paying job this whole year! (9 months, so far.) Somehow, we have lived on the part time wages of a Cracker Barrel waitress, my wife. I did not qualify for workman’s comp, or unemployment. We have received no help from the government. We do give money to the Church. I’m not hung up on the 10% thing. Sometimes we give more, sometimes less. I’m not under law anymore. Here is why I have told this whole big story. Ever since 2013 I’ve been walking in things that are so awesome, and I can finally explain it in a definitive way. 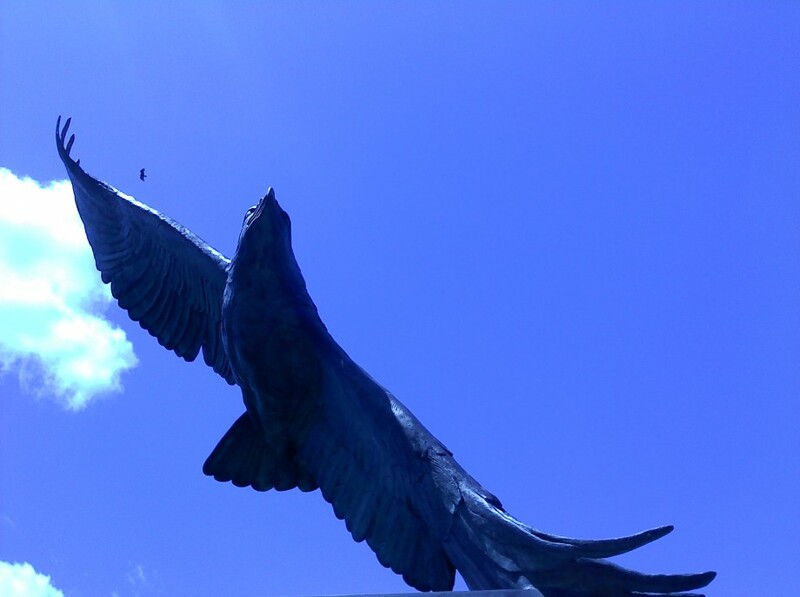 So I have changed this site to an eagle soaring. The eagle is a great supernatural picture! Isaiah 40:31 is a great supernatural formula! I’ve been on a 9 month Sabbatical, with my wife’s permission! The fruit of what God has been showing me will be in this blogsite whether anyone else takes advantage of it, or not. WE’RE NOT CALLED TO LIVE ORDINARY LIVES! I’ve always known that. It is the Holy Grail that I have searched for all my life. It is my joy to share what I am living with whosoever will, or whosoever won’t. That part is up to you. Steve Rogers made a choice to take the supersoldier serum that turned him into Captain America. I know that is fiction and fantasy, but the “analogy” is fact and truth! Open your eyes to see it. It’s your choice. We can have a pathetic prayer life if we choose to. We can live like little flapping sparrows if we choose to. The Kingdom of God came with an Owner’s Manuel called the Bible, God’s Holy Word. You can ignore the Owner’s Manuel if you choose to, or you can seek out the powerful treasures hidden there, and live a supernatural life. We are called to walk on water, but what that looks like will be different for each of us. We are set free in the flames of a fiery furnace. Shadrack, Meshack, and Abendigo went into those flames and all it did was burn off their ropes and set them free! You must desire to be a hero to walk this path. This is not a place for spiritual cowards desiring ordinary lives that disappoint God. I highly recommend you click on my X-Superman button in the header bar. Those messages contain critical information! But you can choose to be too lazy if you want to. You don’t have to do anything to be ordinary. This is what this blogsite has always been about. Hopefully its just gotten better. I agree that the superhero stories touch on God’s truth for our lives. When I was a boy, I ased God to make me a superhero (like on TV). He didn’t answer the prayer he way I wanted (thankfully), but I am just beginning to realize that He might have answered it in a whole different way. Thank you for sharing your journey with us. I know I am inspired! How very interesting. And I thought everyone would think me crazy, but maybe I struck a nerve here. Maybe there are more people like me than I thought about? I’m sure there are other comparisons of how a comic hero relates to being a Christian that could be mentioned, but yes, that whole “mindset” was planted very strong in me during my formative years, as they call it. 🙂 Thanks for reading such a long article, Sean. Not everyone is willing to do that. Don, I am sorry to learn of your bad back and the problems that go along with it. I will pray for you. Bless you! It has actually been a blessing, freeing me up to chase new and exciting avenues. I hope to report on them soon, but I do value your prayers. Thanks, brother. That’s quite the story there my friend, it was a pleasure to read it. So you just keep on telling it, and I’ll be popping in to follow along and see where everything is going. Thanks for the visits to my site, take care of your back as best you can, and know that you are in my prayers. We’ll read you later.